A sofa modelled on Mae West’s lips, wobbly clocks and giant eyes – well, hello, Dali! 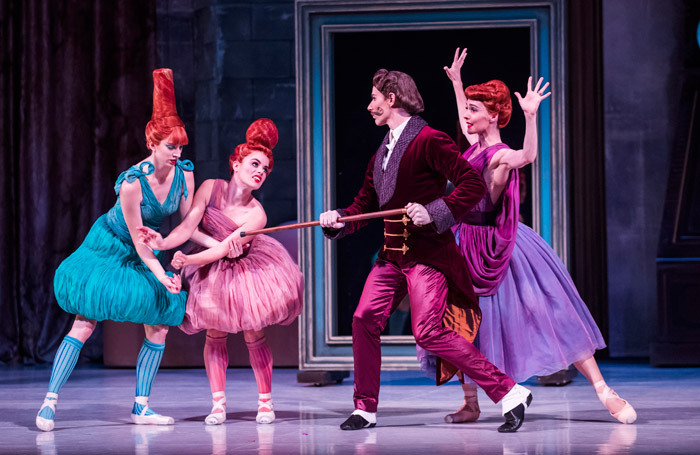 In this version of Cinderella made on the Australian Ballet Alexei Ratmansky slathers on surrealist motifs like icing on a cupcake. Having encouraged his designer Jerome Kaplan to plunder imagery from Magritte, Schiaparelli and Man Ray as well as Salvador Dali he then forgets to create the steps to match. Rarely have I seen such lacklustre choreography so fussily adorned. There is a crudely amusing humour in the battling gestures of the Stepsisters and the Stepmother but the character of the Fairy Godmother is a mystery. Dressed like a Charlie Chaplin with a Cyrano nose she lures Cinders into the solar system where her ‘planets’ assist in her transformation. Dressed in hideous puffball knickers that look like fungal growths they resemble refugees from Cirque du Soleil. Things improve in the ball scene in which Prokofiev’s magnificent dark waltz inspires some invention in the ensemble designs though the soft line of the men’s velvet drape jackets is far more elegant than the women’s trouser-suiting. Kevin Jackson’s Prince enters in a white suit and whiter smile like a cross between Tony Curtis and Dale Winton before spotting Cinders dancing alone. Having shed her Bernadette-like gear for a sparkly dress, Leanne Stojmenov reveals a thrilling and understated technique in her solos and the pas de deux. Their first encounter has all the tentative, simmering wonder that prefaces passion and surrender that one could wish. But far too often, they just don’t have the steps they deserve. Beneath the clocks and topiary that glide like shrubbery Daleks and spin to reveal themselves as metronomes with eyes, plus with all the other surrealist fol-de-rol there is a conspicuous absence of psychological weight or fairytale romance in the dance. Not so much Cinderella as Beauty and the Banal.